You have decided to do the ceiling, but do not know what it do better? I can just recommend you create a ceiling of plasterboard. In - first, the assembly is simple in its execution. Secondly, it is an ideal flat surface. And thirdly, the design of the ceiling plasterboard is so diverse, and may be limited only to your imagination. Sheetrock is a material widely used today in modern repair and decoration. Gypsum plasterboard sheets are coated with solid cardboard, used for lining the walls, creating partitions, and of course, the design of ceilings. When choosing the design for the ceiling of plasterboard, your attention should focus on what it would be the ceiling, single or multi-layered. 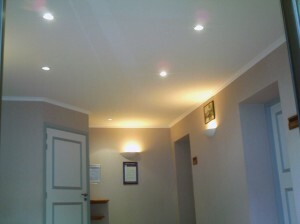 If you opted for one-ceiling, then instead you will get easy installation and cost savings. But in terms of design, multilayered ceiling of plasterboard is much more diverse and interesting. But let us all, take some time one-ceiling. In fact, many people give preference to him, perhaps for reasons of economy, perhaps because of its design. If we talk about design odnourovnego ceiling, you do not think that is just flat roof and no more than that. This is not the case. Designers do not sleep, and try to even this simple type of decoration, to make a masterpiece. And masterpieces are often obtained with the help of an indispensable part of the ceiling plasterboard, namely raster lamps. Thanks to them the location on the ceiling, you can change as the design of the ceiling, and to influence the intensity of lighting in the room. Also, the variety of colors raster lighting fixtures, will make a treasure in the transformation of the type of room, with their inclusion and, of course, changing the design of the ceiling, as well as the light spread to the ceiling, playing their colors on задумке designer. 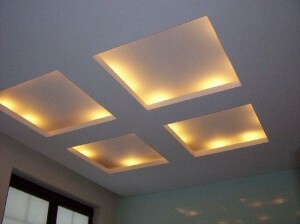 Also to create a design of the ceiling plasterboard, used by drawing pictures on its surface. This type of decoration is not in demand. A pity. Indeed, thanks to him was born a new creation, the new design, new, not like the fellow, an exclusive and unusual ceiling. It creates this creature is very simple. Pencil drawing on the sheetrock does. Making the resulting image volume. To do this, use a liquid paper. Sushim and assemble sheet plasterboard to the ceiling. In principle, not difficult, but will take time to figure drawing. But what design, what the look we get a result. Adorable. So, if you choose to create odnourovnego the ceiling, then perhaps you made the right choice, instead of getting easy installation, cost savings, and the unusual design of its ceiling. If you chose to create a multi ceiling of plasterboard, then its design can easily write a book, and not one. The main two components to create an interesting design multi ceiling, a variety of embedded light fixtures and colors, as well as the variety of designs created with the installation of plasterboard. There certainly are in the hands of your designer, and his immense imagination. If you fire the desire to create a multilevel ceiling, but do not know what they are, please, on the Internet you will find thousands of pictures and comments to them. But I want to immediately warn of the plasterboard ceiling designs are so varied and beautiful in its own way, which is often very difficult to make the right choice. Therefore, try to create in his imagination what you want and try to find a similar picture in the existing photo. And then you can say your wishes carried out.